Milk is naturally low in sugar, but some milk products are sugar-rich. Milk is a valuable source of protein, carbohydrates and micronutrients, such as calcium, B vitamins and vitamin D. Milk and milk products also contain various types and amounts of sugar. If you're concerned about avoiding excessive sugar intake, which can help guard against weight gain and other health problems, learning more about the sugar content of milk can help you make wiser dietary decisions. For specified guidance, seek counsel from a registered dietitian. All dairy products contain a natural form of sugar called lactose. Lactose and other natural sugars consumed in the form of whole foods, including milk, are staples of a healthy diet, says MayoClinic.com. Lactose isn't considered problematic unless you are lactose intolerant, in which case lactose-free milks provide useful alternatives. Natural sugars also occur in almonds, soybeans and rice, which are the basis for numerous non-dairy milk alternatives. Unless these products contain hefty amounts of added sweeteners, they are not considered "high sugar." Added sugars, such as cane sugar, corn syrup and rice syrup, add sweetness and calories, but few nutrients, to foods. 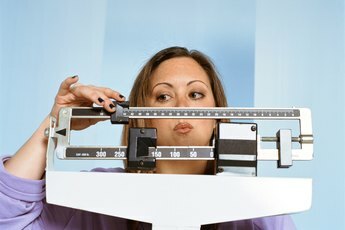 Foods high in sugar and fat, such as ice cream, account for 35 percent of the typical American diet, according to MayoClinic.com -- the potential setup for serious health problems. Sweeteners such as sugar and corn syrup are the second listed ingredient in many flavored milk varieties, while many unflavored milks contain no added sugars. An 8-ounce glass of prepared chocolate milk provides 29 grams of sugar. Eight ounces of cola provides about 27 grams. Milk products, such as fruit-filled yogurt, ice creams, flavored coffee creamers and creamy desserts also tend to contain rich amounts of added sugar. Your body uses all sugar, whether processed or naturally occurring, for energy. In addition to providing energy, milk provides significant amounts of calcium and vitamin D -- nutrients that promote strong, healthy bones. Low-fat milk consumption has also been linked with a reduced risk for breast cancer, diabetes and poor bone health in women, according to The Dairy Council. As a low-glycemic food, milk without added sweeteners promotes blood sugar control, which can help prevent excessive hunger and energy decline between meals. Low-fat milk products, such as plain yogurt and cottage cheese, can provide similar benefits. 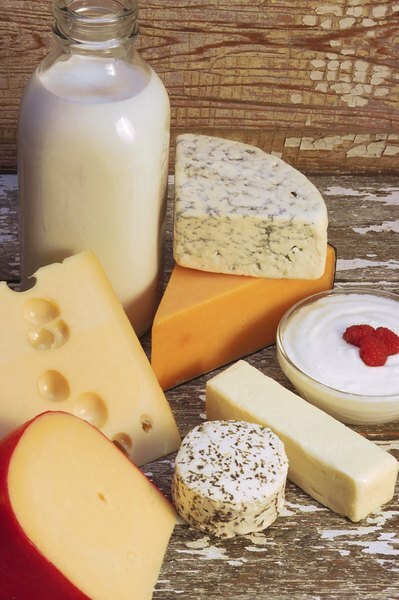 The Academy of Nutrition and Dietetics recommends that women eat a variety of calcium-rich foods every day, including 3 servings of low-fat dairy products, such as fat-free or low-fat milk, cheese or yogurt. High-fat milk products contain saturated fat, which may contribute to weight gain, cholesterol problems and heart disease. 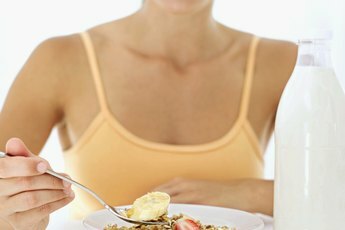 If you don't tolerate or consume dairy products, emphasize other calcium-rich items, such as tofu, sardines and fortified cereals. To keep your added sugar intake in check, choose primarily nutritious whole foods, such as whole grains, nuts, seeds, low-fat milk, fish and lean meats. When you do consume sugary fare, stick to modest portion sizes. The recommended guidelines for added sugar are about 6 teaspoons, or 100 calories worth, per day for most women. Does an Energy Drink Affect Kidney Function? Do Pre-Workout Supplements Cause Stomach Pains?